twin sister Lizzie has a totally different type of personality. They are complete opposites, or so they seem to think. Neither of them know that they have been entered into the same reality TV show called THE CHALLENGE. The producers think it would be fun to put both twins on the same team when they hate each other. Shane lives in LA with her Mum and Lizzie in Washington DC with her Dad, they haven't seen each other in two years. 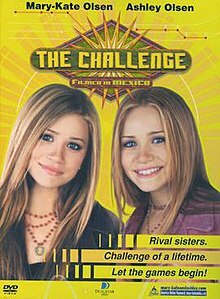 The girls are both put on Team Mayan, will they get along for the sake of both the team and their college scholarships. They do, of course, break some romance rules with some guys. Shane falls in love with a member from the opposite team, while Lizzie falls in love with the show's intern. Mary-Kate and Ashley books and movies. if I hadn't seen the movie You would have made me go and see.